Russian President Vladimir Putin welcomes German Chancellor Angela Merkel during their meeting in the Black Sea resort of Sochi, Russia, May 18, 2018. Bearing a bouquet of pink and white roses, Russian President Vladimir Putin greeted German Chancellor Angela Merkel at his private Sochi residence Friday, where he vowed to push back on any attempts by U.S. President Donald Trump to block a Russian-German gas pipeline project. As news wires reported, Berlin and Moscow are forging common ground on the Nord Stream 2 pipeline, which will allow Russia to export more natural gas to northern Europe despite sharp differences over Russia’s 2014 annexation of Crimea. U.S. officials recently expressed concerns about the project, warning that companies involved in the deal risk being slapped with sanctions. 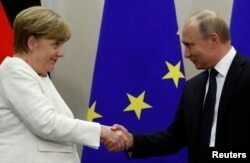 The Putin-Merkel meeting also comes just days after European Council President Donald Tusk took to Twitter in a bitter excoriation of Trump’s decision to pull the U.S. out of the Iranian nuclear deal. Tusk sarcastically said the European Union, which shares Moscow’s position on the Iran deal, “should be grateful” to Trump for subverting the agreement, leaving Brussels in the highly unusual position of uniting with Beijing, Moscow and Tehran on a major diplomatic issue. “Thanks to him we got rid of all illusions,” Tusk tweeted, referring to a broader European political disenchantment with Trump in Berlin, Paris and London. But after White House meetings Thursday with NATO’s leadership, it appears the United States may yet have one European relationship securely in place. Speaking with VOA Serbian Service, NATO Secretary General Jens Stoltenberg said the Alliance won’t be fazed by any burgeoning rapprochement between major European capitals and Russia. “We see a more assertive Russia, and NATO is responding by implementing the biggest reinforcement of our collective defense since the Cold War,” Stoltenberg said. A critical component of reinforced defense is already in place, with “more troops to the east of the Alliance and to the Baltic countries, to Poland,” but with plans in increase troop readiness. “We need to do more of this, increase the readiness of our forces at the meeting in July in Brussels,” he said. “They are using military force against a neighbor, Ukraine, illegally annexing Crimea, but then we see what we call hybrid tactics. This combination of civil-military actions: meddling into election processes, cyberattacks, and we also saw the use of a nerve agent in Salisbury. “All of this requires a response from NATO, and we our responding,” he said. Fresh from White House meetings with Trump, Stoltenberg said they discussed the need to have forces move quickly across the Atlantic. Earlier this month, the Pentagon officially offered to host a proposed NATO Joint Force Command for the Atlantic at its naval facilities in Norfolk, Virginia. One other NATO ally, Stoltenberg said, offered to host a new command center for mobility and reinforcement across Europe. “The Germans offered to host that one,” he said. The next NATO Summit is slated July 11-12 in Brussels. On Thursday, the State Department pushed back on reports that America’s ties with European allies are frayed over the Trump administration’s withdrawal from the Iran nuclear deal. This story originated in VOA’s Serbian Service. Reuters contributed to this report.